National Chairman of the Peoples Democratic Party, Prince Uche Secondus, has warned the Chairman of the Independent National Electoral Commission, Prof. Mahmood Yakubu, to know that history would be unkind to him if he failed to conduct free and fair elections in 2019. Secondus also said that manipulation of election in 2019 would be a recipe for crisis in the country, adding that the INEC chairman would be held accountable. The national chairman of the main opposition party spoke while hosting election team of the Economic Community of West Africa States led by Mohammad Conteh at the party ’s national campaign headquarters in Maitama, Abuja , on Wednesday. He alleged that the electoral commission was already working in conjunction with the ruling All Progressives Congress to rig the election in 2019. Secondus alleged that the commission used the governorship elections in Ekiti and Osun states as what he called rehearsal to practise their rigging strategy for 2019. He also alleged that the commission was already designing special card readers aiming at rigging the election in favour of the APC. He said, “They have finished their rigging arrangements with preloaded cards and special election result sheets , all doctored to favour the ruling APC. “The INEC chairman has no strong will to follow our electoral laws and constitution as well as the laid down international standards in the processes towards 2019 and we want to let the world know this before it happens. 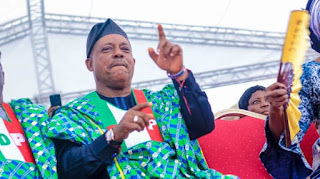 Secondus also said that his party was using the INEC template it saw in Ekiti and Osun states to reiterate its lack of confidence in the commission, adding that nothing had happened to show that INEC was going to do anything different from what it did in the two states. Secondus advised INEC to disregard the size of Nigeria and go to Ghana and pick some lessons on how to conduct free and fair election. He, however, commended the judiciary for standing up for democracy, pointing out that without that arm of government, the country would have become a banana republic. Secondus, who fielded questions from the five- man team from the sub-regional body, expressed the need to have credible election in Nigeria, saying that doing so would go a long way to deepen democracy in the region. Meanwhile, the Chief Press Secretary to INEC Chairman, Rotimi Oyekanmi, in an interview with one of our correspondents, said there was no truth in Secondus’ claim. He said the commission was busy preparing for the general elections and would not take issues with any political party. He said, “There is no iota of truth in the allegation being made by the PDP chairman. Also, INEC ’s Director of Voter Education and Publicity, Oluwole Osaze- Uzzi, denied the allegations. On Ekiti, Osun polls, Osaze- Uzzi, said, “First of all, we are not in the habit of taking issues with particular party chairmen and so, we will not make an exception this time round. “It is very unfortunate if he said so because he is aware that the cases of Ekiti and Osun states are in court, and he should know better that if parties are in court, he should go and get legal advice about consequences of commenting on issues when they are in court. On the allegation of INEC designing a special card reader to rig for APC, he said, “ He (Secondus) obviously doesn’t know anything about how the card reader works. But we have demonstrated it before the political parties. If he wants to, we can come again, demonstrate it. Also on Wednesday, the ruling APC accused the PDP of allegedly churning out fake news, misinformation and using hate speech as its focal campaign strategies for the 2019 elections. The party ’s National Publicity Secretary, Lanre Issa - Onilu, made the allegation in a press statement made available to journalists in Abuja. Issa - Onilu declared support for ongoing global efforts to check the proliferation of fake news. He said fake news and other loathsome strategies must be checked, particularly as the country geared up for campaigns ahead of the 2019 elections. “The consequences of fake news are often dire as it inflames perceived divisions in our communities, fuels hate speech , leads to violence and distorts democratic processes, among others. “Disturbingly, the country’s main opposition - Peoples Democratic Party – and its discredited agents, have continued to deploy the loathsome strategy of fake news, misinformation and distortion of facts as focal campaign strategies for the 2019 elections,” the party spokesman said. Describing PDP as a prodigal party , the APC spokesman said it was not surprised at the opposition party’s typical theatrics in an attempt to evade scrutiny for its 16 years of misgovernance. He added, “It is instructive to the electorate that no lesson has been learnt by the prodigal party . It is indeed clear to the electorate that the PDP is not a party to either be trusted or taken seriously as it has missed out on the opportunity to apologise and show remorse for the cruelty it wrought on our country while in power. “What we witness instead is its weekly disgraceful and embarrassing shadow chasing through fake news and spurious allegations. “PDP cannot pull the wool over the eyes of the good people of this country . It can cry wolf for all it cares, Nigerians won’t be deceived.